Australian all-rounder Brad Hogg has announced he has decided to quit playing for his country. Hogg intends to leave the international arena after next week's tri-series finals against India. However, the 37-year-old said he would consider playing in Australia's domestic first-class competition for another year. He made his Test debut for Australia against India in 1996 but waited more than seven years for his next Test. "My career started against India and I thought if I can play Test cricket against India that would be fantastic," said Hogg. "I wanted to fight to get back in there and I did it and I achieved what I wanted to achieve." 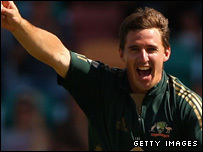 Hogg, a left-arm spinner and handy lower-order batsmen, played seven tests and 121 one-day internationals for Australia and was a member of the sides that won the 2003 and 2007 World Cups. His Test appearances were limited because of Shane Warne's stranglehold on the spinner's job but he was a regular and valuable member of the one-day team. Australia have been hit by a series of retirements in the past 15 months, with Warne, Glenn McGrath, Justin Langer, Damien Martyn, Adam Gilchrist, Shaun Tait and now Hogg all quitting. Hogg's retirement also raises questions about Australia's spin options, with Stuart MacGill still recovering from surgery.